Normally when I review games for Droid Life, I’m trying to find ones that benefit from having a keyboard; these are few are far between, but every once and awhile I find one. 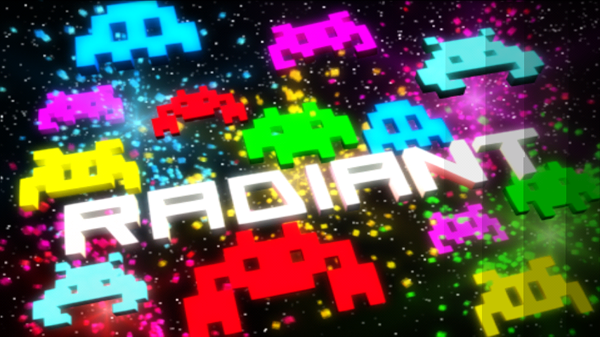 I recently came across indie game Radiant, which is a throwback to many 8-bit games from the “golden” age of gaming. Easily summarized as Space Invaders with RPG elements, I’ll have to give it to developer Hexage; this is a well polished title, worthy of any Android phone. At its core, you play the role of a spaceship pilot in a never-ending war against Space Invader-type aliens, mindlessly shooting forward as you look to destroy your enemies and bring peace to the galaxy. I say mindlessly, because, well, you have no control over when you shoot; the game does it for you. This threw me for a loop the first time I played it, as timing must be carefully laid out when you only shoot in 3-shot bursts. This can be remedied by upgrading your rate of fire (and your ship) at specified points in the game. However, these upgrades don’t carry over from game to game, so if all your lives are exhausted, you must start over from the beginning. As I haven’t beat the game yet (blame my poor reflexes), I can see this getting frustrating in the long run. Your control of your ship is limited to the ability to fly left and right a la Space Invaders; dodging asteroids and dive-bombing fights can be a bit tricky without being able to move forward and back. Steering is normally achieved through tapping either side of the screen while your phone is in landscape mode, but as usual, having a keyboard really helps with tactile sensation. Pilots can either use the “1” and “0” keys (on different sides of the keyboard) or the d-pad; I find the former option more comfortable on my hands. Graphically, the game is awesome. You have numerous objects and particles flying around the screen at once with no slowdown, which can possibly be attributed to the simple graphics. If any of you readers have played Geometry Wars, the graphics are quite similar; the enemies and bosses are both very well designed. Another thing that I normally don’t find praise-worthy in Android games is the sound: Radiant nails the sci-fi music and the gun effects to the point that I thought the soundtrack was influenced by the actions you perform. They sync up very well and bring you into the game. Something I also noticed was how downright snarky your character is written, and that makes me smile. Props on Hexage for actually giving the protagonist some balls and throwing in some meta-humour in there; there’s times where the pilot will muse on how he’s just “flying mindlessly forward” or comment on other things happening in the game. Definitely makes reading the little blurbs worthwhile and adds a layer of polish to the game. The only real problems I had with the game remain with its controls and learning curve. As you start out, you don’t realize that the only way to earn credits to upgrade your ship (besides completing levels) is to destroy small asteroids. This can lead to not having enough credits for upgrades, and arriving at bosses unprepared. Along with transition levels that take place in asteroid belts which are full of invincible space rocks (unless you’ve upgraded enough), the game can simply become too difficult too fast. 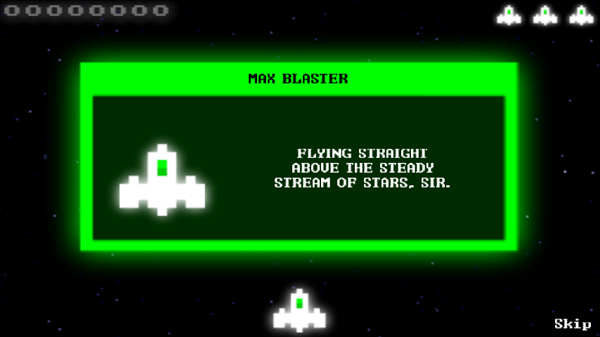 This isn’t helped by the player’s sluggish control of his ship (which, ironically, can be upgraded). Maneuvering those asteroid fields can be nigh-impossible if you’ve boxed yourself into a corner, or don’t anticipate larger asteroids coming up. There are many “commit or die” moments where you have to just go for it; harrowing, but not always rewarding when you fail. All in all, Radiant’s a great game for people who are fans of the genre and love a good challenge. There’s replayability here in the sense you can upgrade differently each time, but players who’re looking to be rewarded with passive bonuses are going to be disappointed. Radiant can be found on the Android Market for £1.50. You can scan the code below to download it.